Avoid the Pump, and Charge up. Gas prices can be a nightmare, never knowing if the prices will go up, or stay the same. We, at TLB electric know this struggle. Because of gas prices, more and more people are driving electric cars. Let ChargePoint bring customers to your door. Why have customers park their car at the competitor when you can meet their charging needs in one place. So what do you get in return? Multiple rebates and incentives from the state and government. Increased marketing by placing your business on Charge Point's mobile app. Installation by a professional team at TLB Electric. The energy used for the charger is paid for by the consumer. Give EV drivers the ultimate shopping experience and a reason to shop longer. 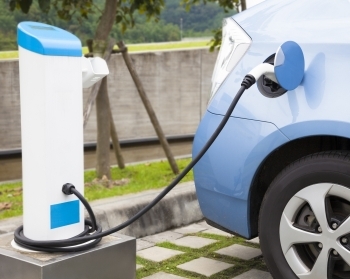 The EV driver segment represents a savvy and desirable customer base that often spend more. 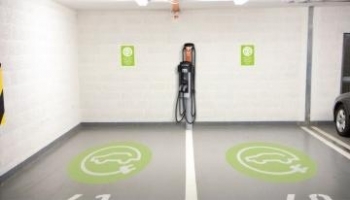 Add a customer benefit with networked EV charging. ChargePoint provides retailers a simple and scalable solution that attracts new customers and turns them into repeat customers. Set up branding and advertising. ChargePoint's stations have customizable signage and video features. Plus the cloud-based network can deliver special offers and loyalty programs directly to your customers. Compete on a new dimension that rewards. EV charging is a compelling and new way to differentiate your business that continues to positively impact finances for you and your customers. ChargePoint solutions simplify monitoring of energy costs, charging sessions and visitors. Its flexibility allows you to remotely control charging access and set pricing to influence shopping patterns. Use Charging Station 4000 Level 2 Public Use Charging Stations provide corporations, municipalities and utilities industry leading EV charging solutions. 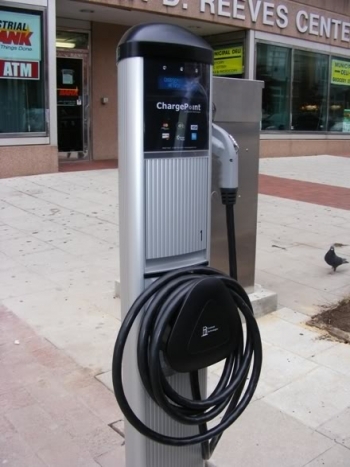 Integrating design and functionality with superior reliability and durability, the ChargePoint charging stations are ideal for workplace, commercial, or outdoor public charging. They are available in bollard and wall mount configurations for easy installation anywhere. For applications where available power may be limited, the innovative power sharing feature enables two charging ports to share a single circuit, allowing for sites with single port EV stations to upgrade to dual port stations without requiring additional electrical services. For new installations, these stations require half the electrical capacity and installation complexity of comparable dual port stations. Models are available with two standard SAE J1772™ Level 2 charging ports, each supplying up to 7.2kW (208/240VAC @ 30A). The need for drivers to coil up the cord is eliminated with the self-retracting cord management system, ensuring that the cord is always off the ground when not in use. ChargePoint Software Service Plans let you control access, set pricing, display advertising, monitor status, and generate usage reports while ChargePoint provides 24/7/365 call center support to drivers so you don’t have to. Take home the world's largest EV charging network with ChargePoint Home: the smartest, smallest and most advanced home EV charging station. 25 RPH (miles of Range Per Hour) which is six times faster than your standard 110 V outlet. Ultra-thin profile and durable construction suitable for outdoor use. Track usage and save on energy. 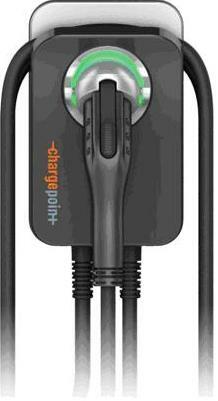 ChargePoint Home can be hardwired or simply plugged into a 240 V outlet. The cord is also interchangeable and comes in three lengths: 12, 18 or 25 feet. ChargePoint Home will be available this summer and we'll announce pricing soon. Use the Contact Us tab to purchase and schedule installation of your Charging Station.